Since removing all ad networks from SiteFever.com, I have received a few e-mails from people asking me how they determine a fair price to ask from advertisers for their own blogs. To put it simply, only charge what you would be willing to pay for the same service. PageRank is a ranking system used by Google to determine a site’s popularity on a scale of 0-10, with 10 being the best (and extremely rare). To verify a site’s PageRank, you can download and install the Google Toolbar, or you can use third party verification services such as DigPageRank.com, which will show you a site’s PageRank as recorded at multiple Google datacenters. It will also notify you if the PageRank is a suspected fake. Alexa is a service which provides third party estimations of a website’s visitors, reach and page views. Rank is measured from the millions all the way to #1. The lower the number is, the better. You can check a site’s Alexa rank by downloading the Alexa toolbar, or just visiting Alexa.com. Technorati measures a blog’s popularity based on how many other bloggers are talking about it. The authority measures how many different blogs have talked about you while the rank measures your popularity as compared to everyone else’s authority. The higher the authority and the lower the rank, the more popular the blog is. 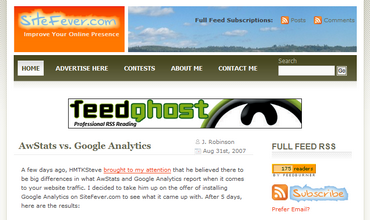 You can check a blog’s Technorati stats by searching for it from Technorati’s homepage. The number of RSS subscribers a blog has is aÂ measuring stick for reader loyalty and interest- the more the better. The only way you will be able to know how many RSS subscribers a blog has is if the blog owner decides to share this information with you, many times relayed through services such as Feedburner. Just be sure the number reported is in fact true. There are sneaky methods blog owners will use in order to fake a higher number of RSS subscribers. I touched on one of these methods in a previous article I wrote. The whole point of advertising on a blog is to get your name out there. A simple, sure-fire way of checking a blog’s popularity is looking at how many comments are made by its visitors. If a blog shows great stats but nobody ever comments, the domain name could have recently been purchased from someone else, or the blog could simply just not be as popular as you thought. The more comments you see on a blog, the more people will be looking at your ad. 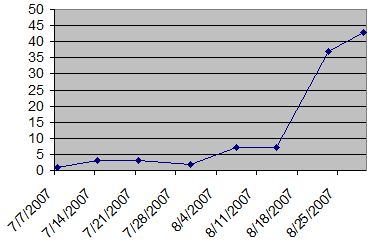 Check to see if the blog owner reports their average monthly unique visitors and page views. This will give you an idea of how many people would see your ad and how many times it would be shown. It may be a good idea to ask for screenshots of the traffic reports to be sure the numbers are valid. Even though any image can be “touched up”, it’s still a good thing to ask. Since the above six stats are things you would be interested in knowing before you advertise on a blog, you can be sure that your visitors will want to know the same. It may be a good idea for you to setup an advertising page where you can report a summary of your current site’s statistics. Then, take an honest look at your blog’s statistics and ask yourself how much you would be willing to pay to advertise on another blog with the same stats as yours.Â There’sÂ the key to discoveringÂ how much you should charge for advertising. Monitor your blog’s performance very carefully and specifically work on the areas that need an extra boost from time to time. By doing so, you can be sure that you’ll find your advertisers soon enough- unless they find you first!